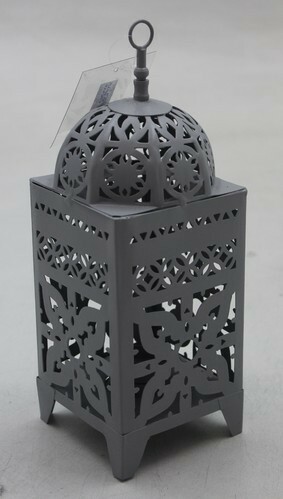 We have a wide range of Decorative Steel Lantern. The offered lamps are developed using Steel/Iron material and innovative designing techniques. The surface and body of the lamps have polish finish. Whether it is interior decoration or events or exhibitions, using the lamps to decorate the wall or shelves adds an additional glamor to the beauty. Established in 2016, Gaabiah [Moradabad] have carved a niche as manufacturer and retailer of Home Decore. Designed and manufactured using quality raw materials, our entire gamut of Candle Light Holder, Fragrance Diffuser, Candle Lantern, Hanging Lamp is acclaimed by our clients because of impeccable workmanship, versatile designs and most reasonable prices. The offered range is beautifully carved and designed by artisans using varied detailing tools. Since establishment, we have been carrying business under some specific principles such as maintaining total professionalism, timely delivery of consignments, providing optimum quality products at market leading price and to look ahead to adopt newer ways to diversify business. The offered range is manufactured using high grade raw material and by utilizing latest techniques of production. Being a quality driven organization, we have hired a panel of industry experts to keep vigilance on all the production methods being carried out. Further, all our manufactured products are subjected to stringent quality tests before we dispatch them for delivery. Owing to such dedication towards quality, the offered range is widely appreciated for their striking features. Moreover, our ability to fulfill emergent of bulk orders within the specified time has enabled us to serve huge clientele.